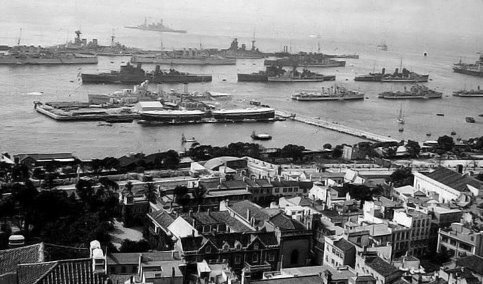 1937 The Civil War continued to dominate events in Gibraltar. 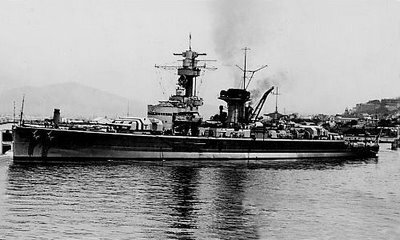 The German pocket battleship Deutschland, hit by bombs off Ibiza, entered Gibraltar harbour. The German Armoured ship Deutschland. The caption on the original photograph states that it was taken while the ship was in Gibraltar but I have my doubts. Note coloured bands on front gun turrets. Like the Admiral Scheer the Deutschland formed part of the International Control naval units which had been set up by the European powers. The ship had been caught napping in Ibiza with its sailors lolling about, sunbathing on deck. Their anti-aircraft guns never managed a single retaliatory shot and to make matters worse, they were unable to get to their medical supplies as the doors were jammed: so much for the stereotype of German efficiency. All told some 26 sailors died, 9 of them of injuries in the hospital in Gibraltar. By a coincidence, the British Gibraltar based destroyer Hunter, which was also part of the International Control, hit a mine at about the same time as the Deutschland incident. Eric witnessed the funeral cortege of both sets of casualties. The former was followed by a handful of people, presumably officials. The latter was a procession of what seemed to be the entire dockyard workforce. The Deutschland subsequently sailed from Gibraltar to shell the Republican port of Almeria and Germany withdrew from the International Control. Lina (1.2) , who sometimes helped Pepe (1.1) at the shop, was always impressed by the formal politeness of the German mariners who entered the shop with much saluting and clicking of heels. A sneaking admiration of German manners, however, did not extend to those of their eventual allies from Japan. 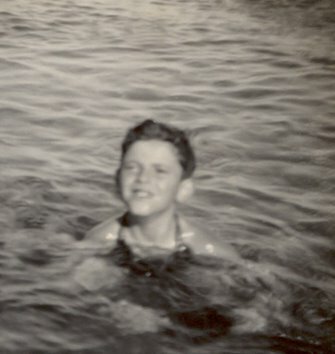 My father, for example, although no racist, found it difficult to stomach the Japanese. It was definitely not an anti-oriental phobia, something that was probably quite common in those less enlightened days, as he quite admired the Chinese. Unfortunately Japanese ships of the Imperial navy were occasional visitors to Gibraltar. One day when one of their warships was in port the Art Shop was suddenly flooded with sailors from the Land of the Rising Sun, pointing at this and that and jabbering away incomprehensibly. 'Chuku, chuku, chuku', was my father's rather jaundiced description of their inscrutable language. Eyeing the sailors with distaste, he decided they had no intention whatever of buying anything and without much ado, began to usher them unceremoniously out of the shop. 'Chuku, chuku, chuku! ', protested the Japanese sailors. Pepe (1.1) was in no mood for any nonsense. 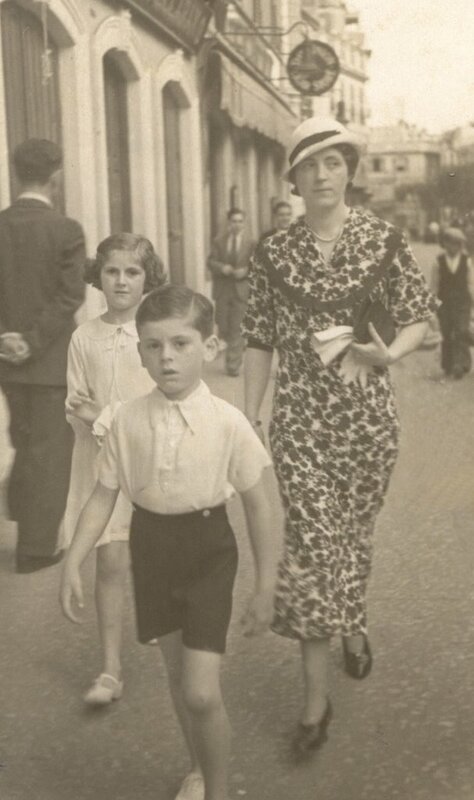 Maruja, Eric and their mother taking an elegant stroll up Main Street. I wonder who took the photo as it does not seem posed. On the back the family’s address is written in pencil as Calle Real 256 by an unrecognisable hand. Perhaps a passing professional photographer took the snap on the off chance and then sent it to them later with a view to selling an enlargement. In London, The Daily Telegraph published a report which suggested that the Germans were surrounding the Rock with fortifications and heavy artillery. The report proved incorrect and was shown to be part of an unsuccessful campaign by Cominform to involve France and Britain in the war. In May, after the fall of Malaga to the insurgents, privileged locals returned to their haunts in the Campo de Gibraltar. It was safe again for the Governor, General Sir Charles Harington, an admirer of General Franco, to ride with the Royal Calpe Hunt. Gibraltar harbour in 1937. There are some major warships among that lot including the Hood and the Rodney. Were we heading for war?